Dashing through the snow, in a puppy pirate sleigh . . . Captain Red Beard has always wanted to compete in the Great Ice Race at the North Pole. After all, the prize is rumored to be the biggest treasure ever! 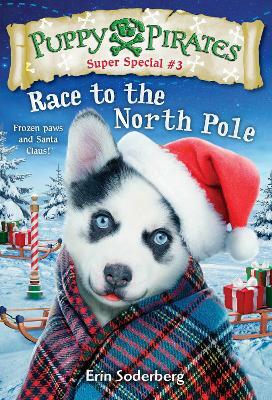 But can a bunch of warm-weather pirate pups really win a snowy sled race? This magical holiday special edition contains extra pirate adventure and a holiday treasure of an ending that will warm young readers' hearts! ERIN SODERBERG lives in Minneapolis with her husband, three adventure-loving kids, and a mischievous goldendoodle named Wally. Before becoming an author, she was a children's book editor and a cookie inventor, and she also worked for Nickelodeon. She has written many books for young readers, including the other books in the Puppy Pirates series and the Quirks series. Visit her at erinsoderberg.com.